The concept is simple. There’s House Wine and there’s No House Wine. 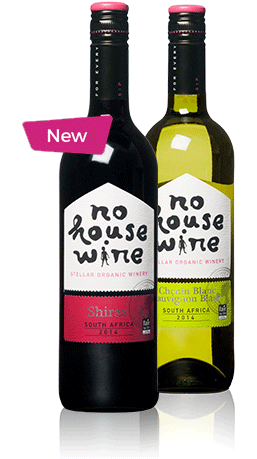 No House Wine builds houses in South Africa for those who need them the most: Aids orphans, and displaced families. The houses are built in collaboration with the HomePlan Foundation and local organisations. These organisations make it possible for the children to go to school, and they provide school uniforms and health care. This is how we are able to create a beautiful world for them, almost effortlessly. Enjoy our good organic wines, good production methods, good projects and good people. It’s great to see this initiative further expand thanks to the many enthusiastic people involved. Which makes it possible to keep on building houses. Read Mbali’s story, a little orphan girl from Kwazulu Natal, who now has a home and a future, thanks to your support of No House Wine. For every bottle you buy, you give a brick back to South Africa. And every bottle of sparkling wine means two bricks. It’s as simple as that. So far, with all of these separate bricks we have been able to build 65 houses. Sip by sip, brick by brick, together we are doing something really cool. At No House Wine we are very proud of this, but we are especially proud of you. Because with every bottle you buy, you make a donation that counts to baie beautiful South Africa, the country where our delicious and honest wines are produced. *Befok is Afrikaans for cool, great, amazing and perhaps even for the ‘kindest’. What started with one bottle, as a modest initiative by designers and volunteers has now seemed to become a ‘movement’ that is working together with fantastic winemakers and bottlers, the kindest importers, lovely stores and great retailers. Each and every one motivated for the cause; we don’t want to be the best, but we certainly strive to be the ‘kindest’. We are proud of all the people raising their glasses filled with No House Wine, so that children have the opportunity to grow up in a ‘home’. And now the people in South Africa want to do something in return. During our last trip we wrote down the most delicious recipes of the local grandmothers and caregivers, which we would like to share with you on this website. Now, you too can be a true Zulu chef! This way, we all get to do what we feel is befok. That is the spirit of No House Wine. And for everyone we might have forgotten to mention here. Thank you too! Thanks to the hundreds of people who have shared the story of No House Wine at great parties, anniversaries, weddings or just while sitting around a campfire. Thanks to everyone who helped make this story come true. We would like to start by thanking all the interns who were there right from the get-go, hauling around numerous boxes of wine. We would also like to thank; dBod for their retail designs, Augustinian Sisters, Studio Boot, Agh&Friends, Franc Wircken (RIP), Angelique Schreuders for good vibes, Tinne+Mia for graphic design, StorytellingProduct, Marjo Kranenborg for her ‘words and deeds’, ADCN + NewYorkFestivals + Esprix for the prizes, all employees and friends at DGSwijn and Coenecoop wijn, Thierry and his colleagues at Paul Sapin, the entire team at Stellar Winery, Fred ofViljoensdrift, Erik Hijweege and Reinout Klazes for the photography, Rickus Dullaert, all the employees and construction teams at the HomePlan Foundation, SiteSupport for building this website and for his advice, Johan Viljoen and Sister Bongiwa for establishing contact with the Zulu Chefs, Banoyi Zuma for translating and editing the recipes from Zulu into Dutch[MK1] . And a big ‘dankie’ to everyone we might have forgotten… a glass of good wine, makes the world a better place. Baie dankie, you are all befok!